STRI is delighted to announce the finalists for the 2018 Golf Environment Awards (GEA), recognising golf clubs and individuals that strive to undertake environmental best practice. The GEA provides the platform from which the golf industry can demonstrate environmental excellence in all its forms. This has been demonstrated by past finalists and can range from relatively simple but effective projects, to grand scale schemes. Set up over 20 years ago by STRI, the Golf Environment Awards are highly regarded in the industry and for 2018 have been joined by The R&A as lead partner. Over 25 longlisted clubs were visited earlier in the year by STRI ecology consultant and GEA judge, Sophie Vukelic, and painstakingly whittled down to 12 finalists. Representatives from the finalists will attend the awards ceremony in January where they will be vying for the honours of either Environmental Golf Course of the Year, Outstanding Environmental Project of the Year, Conservation Greenkeeper of the Year or the Operation Pollinator award. This year, for the first time, all finalists will receive entry into the Foundation Award in Amenity Horticulture course, recognised by BASIS, and the lucky winners will be able to enjoy a European Golf & Environment Trip of a Lifetime to Portugal. Golf Environment Awards judge, Sophie Vukelic, said: “This is my third year of judging the awards and it is not getting any easier choosing the finalists. We had an outstanding array of applications this year, with familiar faces and exciting newcomers to the awards. 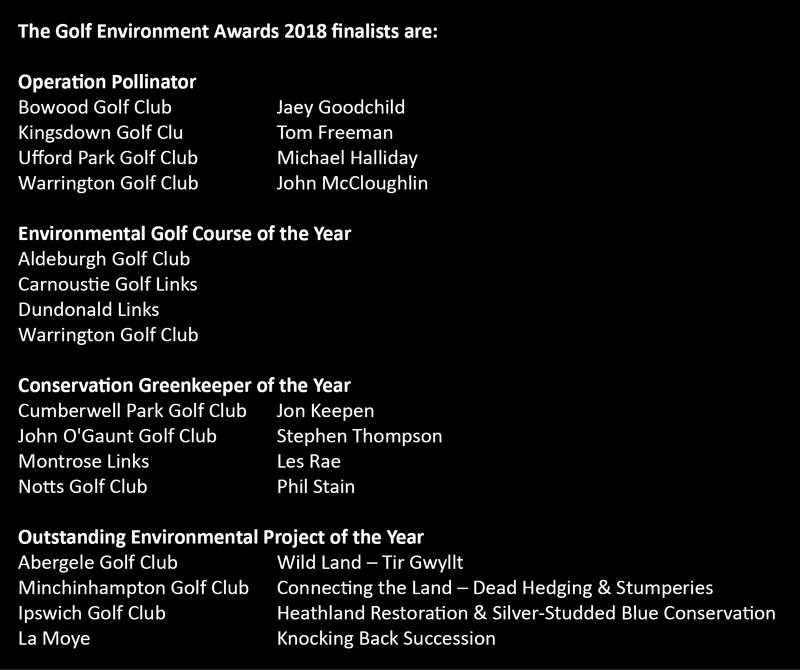 I hope you will all agree, that we have decided on some magnificent finalists, all of whom showcase the highest environmental stewardship within golf. The winners will be announced at the Golf Environment Awards Ceremony on Wednesday 24 January 2018, at The Crown Hotel in Harrogate. Places are available at the awards ceremony, tickets include drinks reception, entertainment, three course meal and wine. Please email enquiries@strigroup.com for further details. STRI would like to thank all the golf clubs that entered but didn’t make the final shortlist.